From the back, L-R: Mark Johanson, Kirk Knight, Brian Galison, Joe Freeman, Nedom Haley, Debbie Segal, Michelle Johnson and Pat Roberts. Mindy helped Pro Bono Partnership of Atlanta clients with invaluable tax-exempt expertise. She also presents workshops for clients every year, holding 4 in 2013. Joe, an employment attorney, took on an impressive 5 projects in 2013 alone. Since first volunteering in 2012, Michelle has taken on about 15 projects for Pro Bono Partnership of Atlanta. Working as a team, Jim and Julie have assisted Pro Bono Partnership of Atlanta clients by performing 26 trademark registrations. Mark and Geoff spent many hours working on an internal investigation for a nonprofit, including on weekends and holidays. For nearly 2 years, Nedom has represented a Pro Bono Partnership of Atlanta client in negotiations with the IRS over a fine that could bankrupt the organization. The Southern Company and Georgia Power have been involved with Pro Bono Partnership of Atlanta since 2006 and consistently provide outstanding volunteers each year. To date, their attorneys have volunteered on about 70 projects. 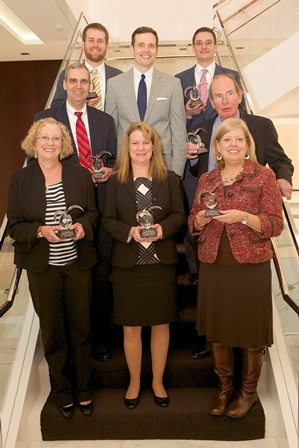 Nelson Mullins attorneys assisted on 30 Pro Bono Partnership of Atlanta projects in 2013 alone. Debbie Segal, retired pro bono partner of Kilpatrick Townsend, played a pivotal role in the development and growth of Pro Bono Partnership of Atlanta and, over the years, helped engage about 200 Kilpatrick Townsend attorneys to volunteer with Pro Bono Partnership of Atlanta.